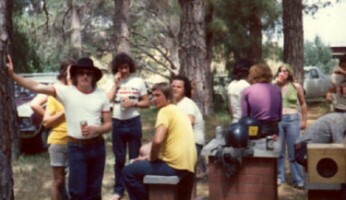 In 1971 the Phoenix club was meeting at the Rose Inn hotel in Sturt St. In that year I recall the average meeting had about 10 people attending and on some nights, the visitors outnumbered the members. I was the Publicity Officer for the Levis Club at that time and, as I knew a lot of the Phoenix members, used to go to their meetings as a visitor. I ended up doing the publicity for Phoenix as well and after 2 years they suggested I change clubs, which I did. That hotel changed hands in 1973 and we needed a new home, so Ivan OHara and I approached the Fountain Inn hotel on Glen Osmond Rd. The publican, Roger Copeland, was happy to have some extra people on a slow night. During our 4 year stay there, the public interest in motorcycles was booming as a result of the big reliable Japanese bikes capturing the market. The era of the superbike had arrived and our membership grew from about 50 to just over 200, we used to regularly get up to 100 people at the pub on Club nights. I became Chairman around that time and keeping control of a room full of drinkers was no easy task. Roger was even happier with this number of people and donated the first Clubman of the Year trophy. 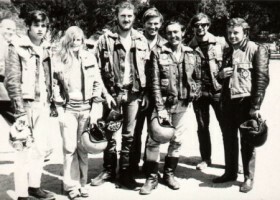 Up until the mid 70s, the AVA ran Road Racing and promoted all the local events. We were running scrambles at our Brooks Gully track but decided, as we had nearly all of Adelaides Road Racers in our Club, it was time we switched to the bitumen. So we gave up Brooks Gully and started running Road Races at AIR. We also started the infamous Fancy Dress Cabaret around that time. Nearly everyone turned up in costume and it was a real bash. Live band, beer drinking contest, male and female strippers for the floor show and all you could drink. By the end of the night the floor was awash with split beer and bodies. After 15 years, two councils refused to hire their halls to us because of the damage to the floors, but by then it had run its course and we stopped doing it. About 1977 the hotel changed hands and we looking for a new place to meet. Other groups were also using the hotel by this time and one Saturday afternoon, Colin Mizon from SARRA and I went for a pub crawl to find a new meeting place for our clubs. Fortunately, the first pub we went to was the Prince Albert in Wright St and the publican was happy to have some new customers on a quiet Tuesday night. It was the boom years and 80-100 people would turn up to our fortnightly meetings. We brought in so much business they had to put on extra staff those nights and even laid on a free supper. Everything ticked along fine for the next decade. 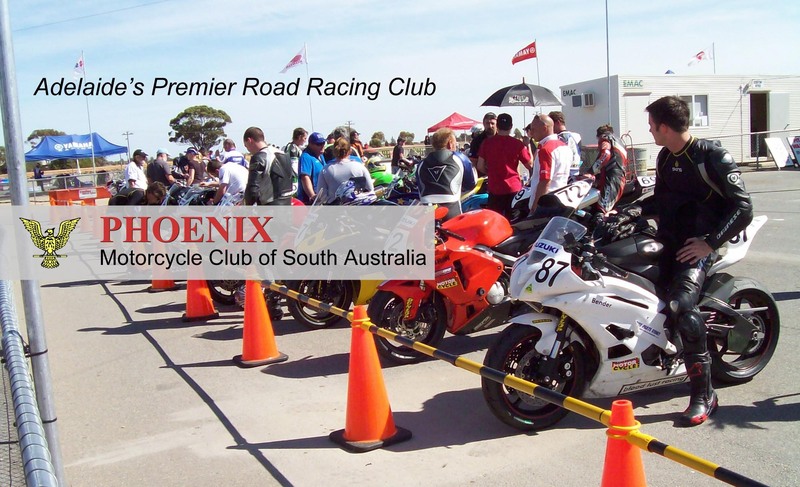 With so many members, the first part of the year was very busy with people lining up at after every meeting to join the Club and get a licence. I stepped off the committee a couple of times during that period to make room for new blood, but the riders were only interested in racing so I returned the next year. It seems to be a feature of club committees that riders don’t get involved until they finish racing. It was also in the mid seventies we were approached to become part of a consortium to run a big race meeting. That fell through, but as part of that process we adopted a new Constitution (couldn’t find the original) and became an incorporated body. I had a copy of the Levis Club’s constitution, so I rewrote that for our club and got a flag made, which was just a German flag with our logo on it. In 1988 we were approached to run the state round of the Shell Oils Australian Championship. It was a bigger event than we were used to, so we formed a sub committee, co-opted interested people from other clubs and started planning. For some reason I ended up as the event manager even though I had voted against the Club doing it. One of the things that made planning and running the event difficult was the races had to be run to a timetable for TV coverage. Luckily, on the day I had a nice cosy spot in the race office and the only drama I had was the TV director wanting to hang the starter for letting the feature race go 5 seconds early and upsetting his live cross to a national broadcast. Considering a hail storm had struck during an earlier race that day, I thought the starter (Glen Dix) did well. Clem Smith, the owner of the Mallala circuit had managed to poach the Shell car races from AIR (they were promoting drag racing which made the track hazardous for other racing) and the projected income from that allowed him to make improvements to what was at the time a run down complex. In 1988 we erected rented tents in the pits and hired them out to the riders, and there was only one grandstand. Now, there are permanent pit garages and spectator facilities and the place has really changed. After managing the Shell event again in 1989, I decided to retire from the committee due to work commitments and drifted away from Club life in 1990. I can’t talk about those days without mentioning some people who gave so much to the Club. Two people who kept the fires burning in the early days were Ivan OHara and Bob Hill, both tireless workers and promoters of the Club. Bob in later years claimed he was robbed of his life membership when we lost our record of it. Sorry Bob, but at least you get recognised here. Roy Fryar spent most of the 70’s on the committee and was always promoting the Club and trying to get new members. John Taylor was our President and longest serving member, active for over 30 years and the backbone of the Club. Many social functions were held at his house at Rostrevor and later at Hahndorf. He will be missed by everyone. Gerard Edwards was another mainstay of the Club for many years. He took over from me as Chairman when I became the Secretary then Treasurer. Most of my friends over the last 30 years were from the Phoenix Club so in 2001 I came back. I found the racing scene has changed over the last decade and the membership of the club has fallen, but some familiar faces were still there. Unfortunately the boom years have passed, but things go in cycles and one day there will be a resurgence in the sport when all those Harley riders realise its not a real motorcycle. Note: after 30 years our 1974 constitution became out dated and was re-written by Glen Seidel in 2002.